Boston-based Mullen, a unit of Interpublic Group, had an outstanding year on both the creative and media fronts. Against all odds, it dazzled Adland with its unlikely win of the Acura creative review in which it was considered a dark horse contender at best. The agency tapped into the cultural zeitgeist with campaigns like the one it did for realtor Century 21 in which it sold the home of Walter White, the anti-hero in AMC’s hit drama Breaking Bad after the series ended earlier this year. And the agency found innovative ways to market brands on new platforms, creating, for example a short film for rental company Airbnb that was comprised entirely of user-generated Vine videos. And it sold Acuras on the social shopping site Gilt.com, the highest priced items ever sold on the site. On the media front, the shop focused much of its effort in 2013 on rethinking its strategic direction toward screen planning and struck a forward-thinking deal with ad platform Millennia Media that helped its clients market better in the mobile space. The agency also pushed harder than ever at coordinating and integrating creative and media efforts. National Geographic Channel, for example, started as a media AOR client and within six months was tapping into Mullen creative services as well. Acura on the other hand uses Mullen as its creative AOR, although Mediahub/Mullen social and digital teams regularly contribute to the agency’s work for the client. For its innovations in both the creative and media sectors and its efforts to make both disciplines work in cohesive and effective unison for clients, Mullen has been named MEDIA magazine’s 2013 Full Service Agency of the Year. Work for the National Geographic Channel illustrates how Mullen’s efforts on a number of fronts crystalized to boost client campaigns. 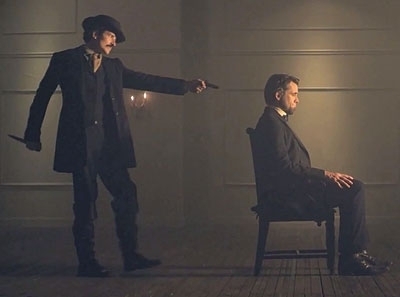 Earlier this year when Nat Geo launched one of its most ambitious original projects ever, the docudrama Killing Lincoln, the network wanted to reach beyond its core audience. The challenge for the network’s agency was to make the program stand out in an avalanche of Lincoln coverage and often against competitors with much larger spending budgets. Creativity, screen planning and the Millennial deal all came into play. Time and proximity drove the network’s strategy. Research showed that nearly 90 percent of multiscreen activity occurred between TV and tablets. The agency used that insight to create a plan to capture channel surfers. In the eight-hour window leading up to and during the premiere, Mullen targeted tablet users logged in via Wi-Fi networks... ensuring that intended recipients of the messaging were at home and likely parked on their coaches. From 2 p.m. to 8 p.m. the creative in the tablet ads showed an overview of the documentary with a click to video for additional content. After 8 p.m. the creative was dynamically updated to serve tablet users with messaging about which part of the program was currently in progress (Conspiracy, Assassination or Manhunt). Location-based phone ads were added to the mix since there were several locations that played a role in the story. The agency seeded tips on Foursquare, so that when users checked into locations near sites relevant to the assassination, they would get a tip urging them to watch the documentary. The program achieved the second highest household rating in the network’s history. Tablet banner interaction rates were 50 percent higher than industry norms. A companion website created for the program was nominated for an Emmy for Outstanding Interactive Program. The Mobile Marketing Association cited the campaign as one of the best of 2013. “We’ve made it a mission and a mindset to really get aggressive in the mobile space,” said Moore. The agency’s research shows that for many consumers mobile is the screen they’re focused on in the early morning , while simultaneous screen usage is greatest from 6 p.m. to 8:30 p.m. “It really recalibrates how you think about the media plan,” Moore said. And for some Mullen clients those findings have driven a reallocation of dollars. “We took money out of TV in the early morning dayparts [and put it toward] mobile where consumers are spending more time,” Moore said. For example, Moore said that for client PBS, the agency shifted dollars toward mobile applications relevant to moms or to children. For VH1, dollars shifted to apps created by entertainment-oriented publishers like People or E! The deal with Millennial helped Mullen execute its award-winning work on Killing Lincoln. The partnership — which provides mobile insights, first looks and preferred rates for Mullen clients — also helped the agency shape campaigns for Ernst & Young, Olympus, and JetBlue among others.